As we get into this odd transition weather, my skin does a little freakout dance and decides to pop a few patches of dryness in the most random places. Little spot on my inner arm? Dry patch! Rectangle on my outer thigh? Dry patch! Hexagon at the base of my skull? Dry patch! My defense against these mini-deserts (not mini-desserts, mmm) on my body? A small cylinder-ish jar of Ora’s Amazing Herbal All Purpose Salve. Though so far I’ve only used Ora’s Amazing Herbal All Purpose Salve to treat itchy, dry patches (and moisturize my elbows and feet), this little jar of gooey goodness is clearly a do-it-all healer thanks to its rich ingredients list and lovely texture.Comforting calendula is famous for treating and preventing scars, while extracts such as burdock, thyme, rosemary and tea tree are hailed for their skin-calming properties. 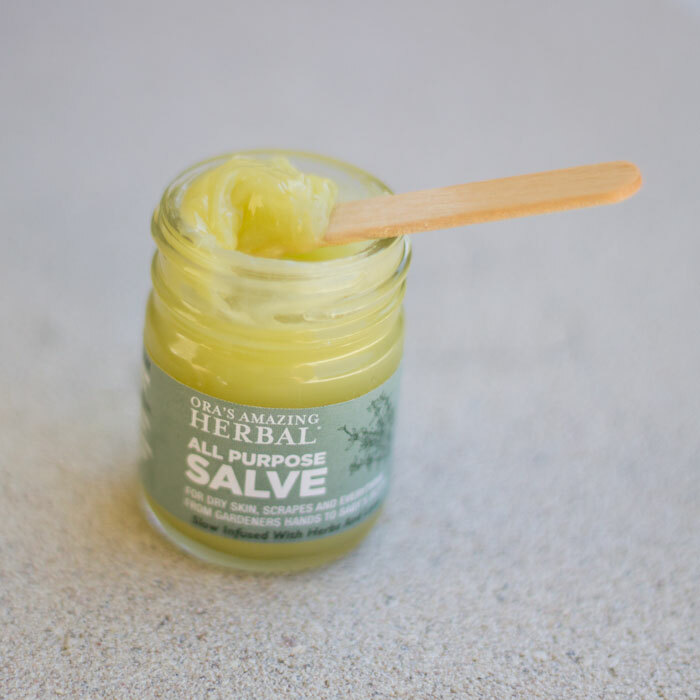 This is the perfect salve for treating pesky bites and minor burns and belongs in every natural medicine cabinet or camping kit. Speaking of camping (which I don’t do — put me in a bed, please! ), Ora’s Amazing Salve smells like the forest after a fresh rain. Yes, I just told you I don’t camp, but I do enjoy hiking and being in the woods, and this scent — a distinct yet faint wash of cedar with hints of rosemary and tea tree — is just comforting, like earth and trees, without being in your face about it. At $8.99 for a 1-ounce glass jar full of dense salve, Ora’s Amazing Herbal All Purpose Salve is a steal and a staple for any natural medicine cabinet. I’ll be keeping it stocked out of sheer “just-in-case-ness” and because, well, it’s quite the kickass, all-purpose salve! The Ora’s Amazing Herbal team mentions they’ve used it as a lip balm, and I could see myself scooping a bit of this onto my pucker during those harsh winter days to cure chapping and chafing. The team also mentioned using the All Purpose Salve as a wrinkle cream! I’ll be passing on that use, as the salve is incredibly rich and thick and my facial skin will likely not agree with it, but if you’re dry — like, really dry — it may work for you! And now that I’ve said that, I will likely get an odd-shaped dry patch on my face this fall / winter. What’s in your natural medicine cabinet? Have you tried anything from Ora’s Amazing Herbal? Tell me in the comments section!